The club owns a fleet of training boats which are used for training. It is a recognised ISA training Centre. There was a great atmosphere at last weeks Easter camp and In fact most of these juniors are already signing up for a two week course in July. An adults' course run over four Tuesday's in May and is a great way of meeting new people as well as learning a new skill. All club members have access to club boats but most use their own boat meaning that there is always club boats available.If you already have a boat the there is a place to park your boat at the club. The fleet is a mixed fleet and is made up of Wayfarers, Enterprises, GP 14's, Lasers, RS 200 & 400, Omega's and Mirrors. The season is just moving into full swing now with the open Spring Series on every Sunday and our Spring Regatta is on May 10th visiting sailors welcome. Races start at 14.00, but there is lots of space on the lake for those who want to practice or potter around. Racing changes to Thursday nights in May, but Sunday sailing continued almost every Sunday last year such was the enthusiasm . The club hosts a number of open events each year in spring and autumn with boats coming from as far away as Northern Ireland. 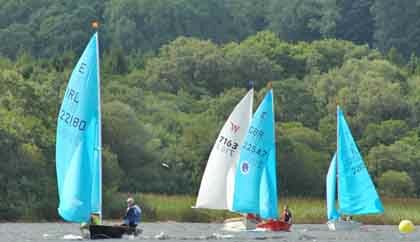 Last year the club was commended by the ISA for running the first ever inter club junior Sailing club regatta. 42 juniors took part in sunny windy conditions. Club members travel to various regional and National events around the country. One year,10 Cullaun boats travelled to Cork to sail in an International event and club members have travelled abroad representing the Mid West at both European and World events .